It's the first time that a North Korean government official has flown directly into the US capital without any stopover in another US city. He left the airport through a side door, accompanied by what appeared to be US and North Korean officials, including Stephen Biegun, the US special representative for North Korea. Biegun was seen inside the airport earlier but refused to answer reporters' questions. Kim, vice chairman of the ruling Workers' Party Central Committee, is expected to have talks with Pompeo on Friday in a bid to finalize the details of another meeting between the leaders of the Korean War foes. There is no word from the Trump administration on the envoy's visit. The State Department has repeatedly said it has "no meetings to announce." A second summit between Trump and Kim would seek to break an impasse in negotiations over the North's nuclear weapons program. Trump and Kim first met in Singapore in June and agreed to work toward the complete denuclearization of the Korean Peninsula in exchange for security guarantees for the regime. US Vice President Mike Pence said Wednesday that the North has yet to take "concrete steps" to dismantle its nuclear weapons. Some time after he left the airport, Kim Yong-chol was filmed by broadcasters entering the Dupont Circle Hotel, some 10 blocks north of the White House. 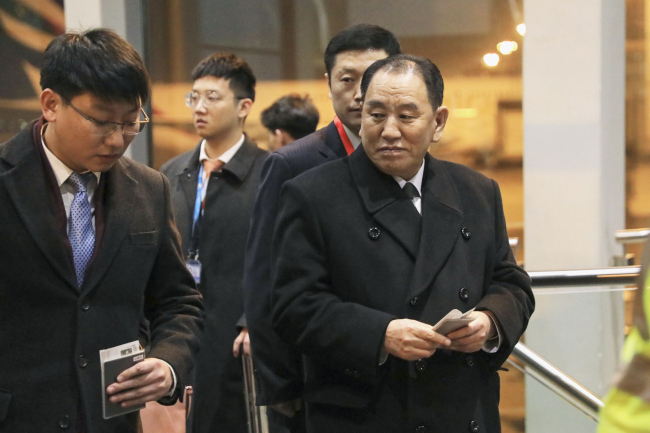 He is expected to stay for three days and return to Pyongyang via Beijing on an Air China flight departing at 3:35 p.m.